Hi friends! Happy Friday! I hope you all had a wonderful week! For those of you who are following along with my head issues, I'm going to the pharmacy to pick up some migraine meds today and that *hopefully* will hold me over until my MRI on Wednesday. Friday means Friends with Flair on the Unity Blog! I decided to make a card for this month's Unity Challenge to make a fruit themed card. I used last week's SCS sketch challenge for this card. I'm a little in love with this card. I just found my Cosmo Cricket Delovely papers and it makes me HAPPY! :) Especially when I used my Unity/Cosmo Cricket Delovely stamps with them! Love the colors and pattens! Nice job. Super cute! Love the twine on the pear. :) I hope your MRI goes well! Love the colors and patterns in this card! 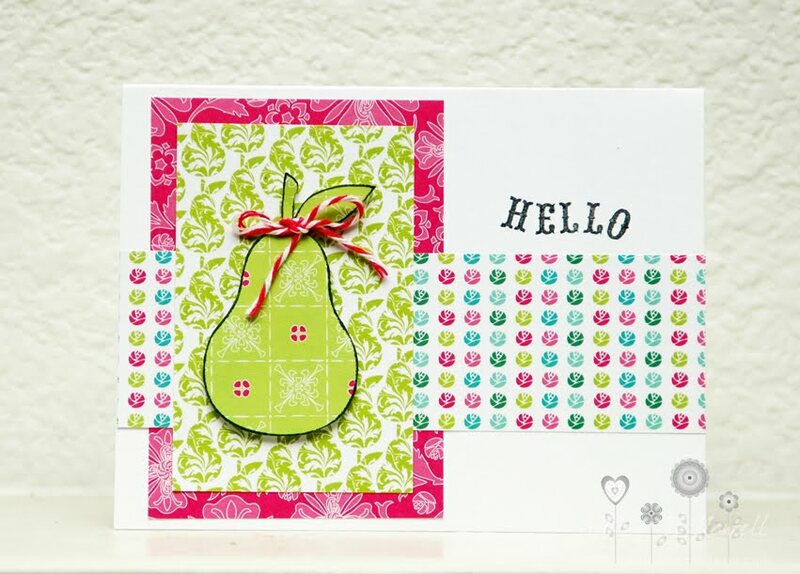 Such a cute card, I love the twine around the top of the pear too! Your is bright but cute nicely done! Love this - I love the bright colors too! Love this, love the bright happy colors! Hi Ashley! Your card is SO adorable!! Love the happy colours! I am glad you were still able to craft a little even though your head isn't cooperating with you. Your card is so fun with the bright colors! I hope the meds help you until they can figure out how to make a permanent and happy fix. Good to see you rocking some Cosmo Cricket papers too! 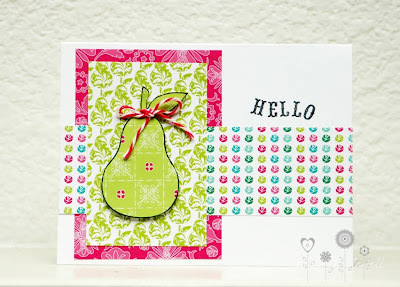 LOVE that pear--what a great idea for the fruit challenge;) LOVE your sentiment too! FUN! sooo cute, Ash! love the fun papers. thanks for playing! Super cute girlie, hope you are feeling better! !